Between the sounding of the sixth and seventh trumpets of Revelation, two stories are inserted. Like chapter 7's pause in the narrative of the seven seals, the story of the trumpets also contains an interlude. 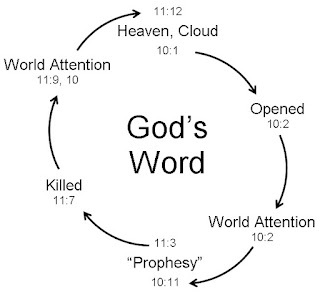 The trumpet interlude is Revelation 10:1 through 11:13. The two stories told in that break are the unsealing of the book of Daniel and the French Revolution. You can read my Revelation 10 commentary in The Patmos Papers. I haven't prepared the chapter 11 commentary yet. It may be observed that the French Revolution actually happened before the unsealing of the book of Daniel, yet the order is reversed in Revelation 10 and 11. Why is that? A second reason for the reversed sequence is the placement of these stories in the overal literary structure of the book. You can view the complete chiasm structure of Revelation in The Patmos Papers. We find that chapters 10 and 11 are in a mirror relationship with chapters 13 and 14. 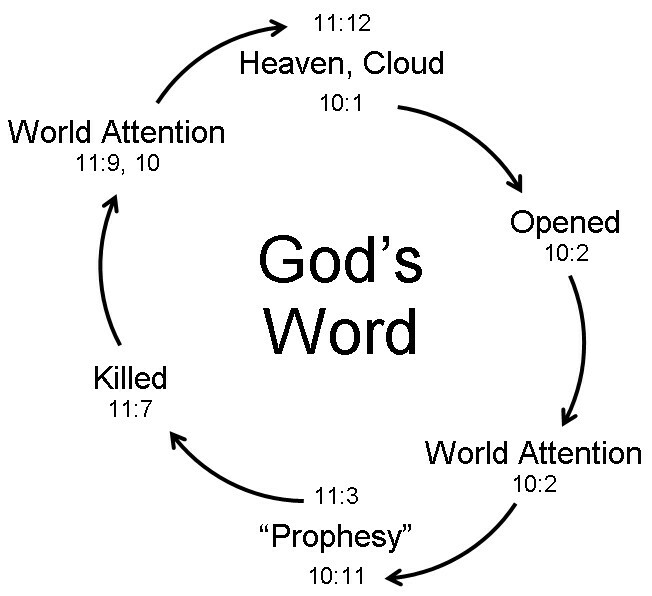 Christ's work, begun in a cloud in Revelation 10:1, is brought to completion in a cloud in Revelation 14:14. And the two witnesses in chapter 11 are presented in contrast to the two beasts of chapter 13. This mirror pattern calls for the stories in chapters 10 and 11 to be told in this order.